Exploriverse Math Ice Cream is a maths game based around the theme of Ice Cream to help enhance user engagement. The progress of the user is tracked so that the parent or teacher can monitor the progress of the child playing the game. The game is complimented by bright and colourful graphics which visually depict the progress of the ice cream van down a fantasy fruit embellished street. The background music provides a suitable calming but earnest backdrop to the programme. Exploriverse Math app is a highly useable programme. Downloading the app from the store is painless and the user is immediately brought into the street with a helpfully placed pointing, animated finger to guide you effortlessly to your first task. Generally the graphical user interface is excellent and enhances the process of learning. The bright colours and fantasy houses lined up along the street with animated figures and insects add to anticipatory eagerness to get into the tasks and make progress. Navigating through the game is easy with some excellent graphics and written instructions complimented with an earnest sounding voice over ready to prompt the user. Progress through the task is recorded by a generic set of tick buttons which switch on with a tick once the activity is complete. The app appears to have no lag when changing between activities and can be played off WiFi. The app does exactly what the developers say it will do with a repeated and increasingly difficult sequence of six activities: writing, counting, addition, subtraction, coins and time. For the writing activity the child has to trace the number either with their finger or a stylus pen to get the required toppings for the ice cream. The number is presented on lined paper to give the child an indication of the comparative size each digit is animated to provide an idea of direction when writing. The addition and subtraction activity presents the user with a sum, for example 11 + 0 = ? and the answer is visually represented by the number of ice cream scoops, the child then has a choice of five numbers to choose from to drag and drop on the answer. At the end of each sequence the child is presented with an ice cream trophy. The coin activity is based around dragging the coins into the till to buy your ice cream. The reading activity displays a clock with a time and the child has to fill in the correct time on a digital clock. All the activities are good but some minor tweaking could be achieved to enhance them still further, the clock on the reading activity could more accurately reflect the time by ensuring the little hand is properly positioned slightly past the hour setting, this certainly caused me a bit of confusion. When writing the number in the activity it is possible for the child to write the number in the wrong direction and still move onto the next activity, perhaps the writing sequence and direction should be mandatory? The coin activity is obviously American and would probably appeal to a wider audience if the values were no currency specific or the parent/ teacher had a choice in the preferences. With all children’s programmes I tend to find one of my grandchildren to thoroughly test it! Having chosen my inquisitive six year old she proceeded to lap it up and was actively engaged for some time, so she definitely voted thumbs up! I especially like the parent/teacher dashboard which gives you a quick reference to progress, although the email function to send the activity log did not work, this will probably need further adjustments. In conclusion this is a very creditable application with children appeal that clearly engages the user in a valuable learning activity without being too onerous. Do you hear that musical tune coming down the street? It's Exploriverse Math Ice Cream! Delivering the most delectable ice cream treats topped with fun common core math game play! Adventure through 10 fun ice cream worlds. Themed after your favorite ice cream flavors! Including Chocolate, Strawberry, Mint Chocolate Chip, Neapolitan, Rocky Road, Cookies & Cream, Bubble Gum, Pistachio, Cookie Dough, & Coffee. Inhabited by cute animated critters! Exploriverse Math Ice Cream is based on a learning system designed to help both right brain and left brain learners. All six fully interactive activities use visual aids and voiceover to make for an effortless learning experience. Curriculum is based on first grade common core math standards. Give your kindergartner the head start they deserve! Or your first grader an app to enhance their homeschool or classroom learning experience for greater success. Also a great tool for keeping your child's skills sharp all summer long! Our apps are designed to help children gain confidence in their math abilities, which in turn motivates them to learn on their own. Awarding treasures including new missions, ice cream flavors, & toppings when a mission is completed helps with that goal. 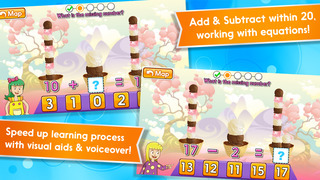 While playing Exploriverse Math Ice Cream keep track of your child's mission progress & play time. With the "Email Activity Log" feature, have the history emailed to you for your annual homeschool evaluation. 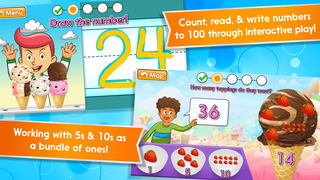 Educational apps, like this one, count toward math curriculum activities. The perfect companion for any homeschooling parent. - Six fully interactive activities: writing, counting, addition, subtraction, coins, & time! - Over 720 exercises aligned to Common Core Math Standards! - Parent tools tracking mission progress & daily play time! 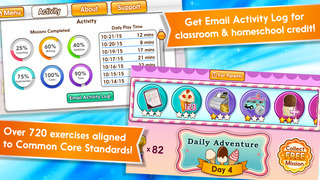 - Homeschool Friendly - email activity log for annual homeschool evaluation! - Discover 10 ice cream worlds themed after your favorite ice cream flavors! - Count, read, write to 100! - Add & subtract within 20! - Working with fives & tens as a bundle of ones! - Understand 11 to 19 composed of tens and some ones! - Learn the value of coins, heads & tails: including penny, nickel, dime, quarter! - Tell & write time in hours, half-hours, & minutes! 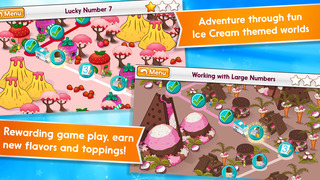 - Rewarding gameplay - earn 20 flavors of ice cream & 14 different toppings! - No time limit or high-scores - play at your own pace! - Available for both apple phones & apple tablets! feedback is important to us, let us know what you think of this app! What do you want to see next? Share your ideas by submitting your review on the App Store, or share it @exploriverse on twitter & facebook!